The Radiotherapy Physics section is responsible for providing a major clinical scientific and technical service to the Radiotherapy Department of St Luke’s Cancer Centre with a catchment population of 1.4 million from Surrey (and beyond) for both external beam radiotherapy and brachytherapy. Outreach radiotherapy commenced clinical treatments in July 2014 at a satellite unit at East Surrey Hospital, Redhill. Over 50% of patients, excluding breast field in field treatments, receive Intensity Modulated Radiotherapy (IMRT) predominantly with RapidArc, the most technologically advanced form of IMRT. The department has been commissioned by NHS England to provide Stereotactic Ablative Radiotherapy (SABR) treatments for oligometastatic disease and an intracranial Stereotactic Radiosurgery (SRS) service has been developed. The Department was also one of three centres appointed to provide a mentoring service to help develop SABR nationally. The department also boasts one of the largest prostate brachytherapy service in Europe. Links exist with Varian Medical Systems, which has seen the department beta test the knowledge based radiotherapy treatment planning system, RapidPlan, and provide the first treatment worldwide planned with this software. This software is now in routine clinical use within Guildford and reduces the time required for complex radiotherapy treatment plans and enables less experienced treatment planning staff to produce highly complex plans. Excellent links exist with the National Physical Laboratory and a joint consultant physicist post has been appointed to help develop NPL’s clinical services. This has led to national dosimetry intercomparisons involving all UK radiotherapy centres for SRS, SABR, Volumetric Modulated Radiotherapy and High Dose Rate brachytherapy demonstrating consistent radiation dose delivery to patients across the UK for these advanced radiotherapy treatments. This work has been in collaboration with the National Cancer Research Institute’s (NCRI) Radiotherapy Trials QA group and has also acted as a means of accreditation for clinical trials, thus increasing patient uptake with these advanced radiotherapy techniques. The Section is also responsible for ensuring the Trust meets the statutory obligations of the Ionising Radiation Regulations 2017 and the Ionising Radiation (Medical Exposure) Regulations 2017 with regard to radiotherapy, national dosimetry codes of practice and national guidelines. In order to meet this statutory requirement, the team has to work to a high level of expertise and implement national and international standards of dosimetry and safety. The Whole Time Equivalent establishment is currently approximately 20 physicists and 10 dosimetrists / treatment planners with a further 8 technical staff in the technical services section supporting radiotherapy. Establishing and developing the scientific infrastructure to allow the provision of a radiotherapy service for patients. 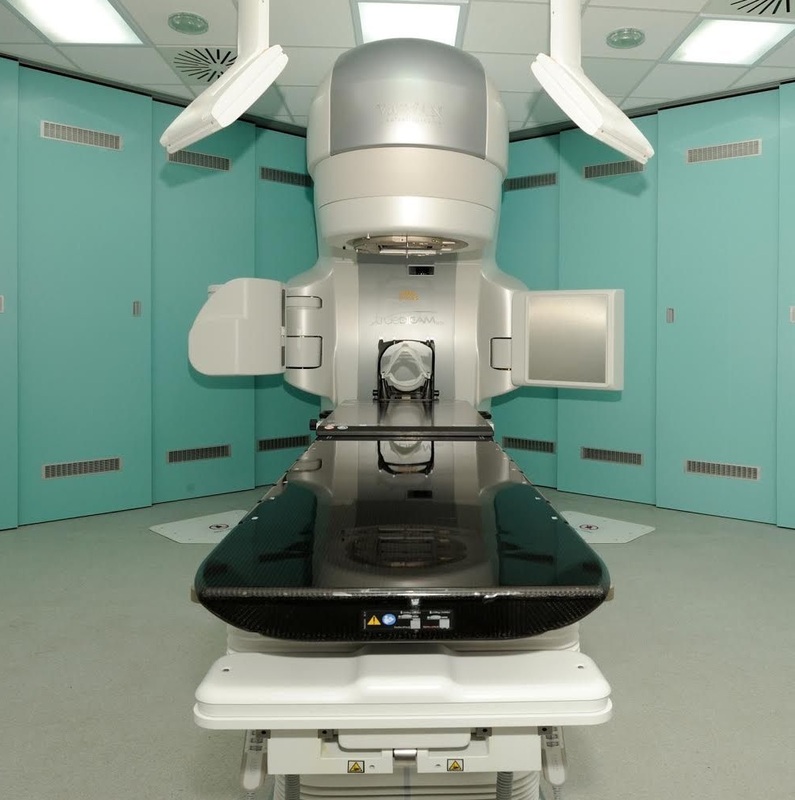 Safe and accurate radiotherapy from 8 multimodality linear accelerators, triple energy kilovoltage unit, 3 dedicated radiotherapy CT scanners, Papillon kV rectal cancer unit, high activity radioactive sources for High Dose Rate brachytherapy, and implantable radioactive Iodine prostate seeds. The specification, evaluation, selection, acceptance and commissioning of ultra high cost clinical equipment including linear accelerators, advanced imaging equipment and computer calculation systems for 3D treatment planning. Conformity and design of intercomparisons with national dosimetry standards traceable to the National Physical Laboratory. This involves concentrated work with a detailed knowledge of atomic physics to ensure that the machines are set to deliver accurate and consistent radiation doses. Management at all levels of external beam radiotherapy patient treatment planning using advanced 3D computer calculation algorithms and including design and operation of highly specialised detailed check processes on all data, independent calculation and verification by measurement. Autonomous decision making and practice with regard to the safe delivery of the dosage in external beam and brachytherapy planning at policy and individual patient treatment levels. Research and development and implementation of advanced treatment techniques and advising medical and other clinical staff on their implications and implementation. The continual modernisation and advancement of the scientific basis of radiotherapy and rapid assimilation of new technology and advanced clinical methods [e.g. intensity modulated radiotherapy, new brachytherapy solutions (real time prostate brachytherapy, Papillon rectal, HDR rectal & oesophageal) integration of MR, PET and PET/CT images into treatment planning, Image Guidance, radiobiology, dosimetry]. Provision of advice to clinical oncologists, radiographers and technical staff on all aspects of radiotherapy physics at policy and individual patient levels. Provision of guidance to the mould room team on optimising individual patient immobilisation and shielding. Design and management of radiotherapy treatment machine calibration and quality assurance programmes. Control and safe use of radioactive sources for brachytherapy to meet HSE, CQC, Environment Agency and other requirements. Ensuring the safety of patients and staff in a hazardous environment which includes patient exposure to very high levels of ionising radiation. Organisation of training programmes in radiotherapy and the training of graduate medical physicists as an accredited training centre.